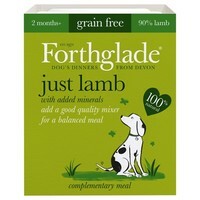 Forthglade Just Lamb Grain Free Dog Food has been made with 100% natural and wholesome ingredients, to create a delicious lamb dinner for your dog. Enjoyed as a tasty treat by itself, or mixed with a good quality mixer to create a nutritionally balanced meal, Forthglade Just Lamb is highly digestible and has been slow cooked to retain maximum goodness. Rich in Protein - It's just proper lamb and some added minerals. Easy to digest and highly palatable. Grain Free - Great for dogs with sensitive tummies. Gently Steamed - A little water is added to help cook everything slowly and at a low temperature to retain all the natural goodness. Great food. Both my dogs love this meat mixed in with meal. Bowls are llicked clean. I use this food as a topper with his Royal Canin Junior for my spaniel puppy, it adds enough meat to make his meals interesting, without duplicating the contents of the kibble.